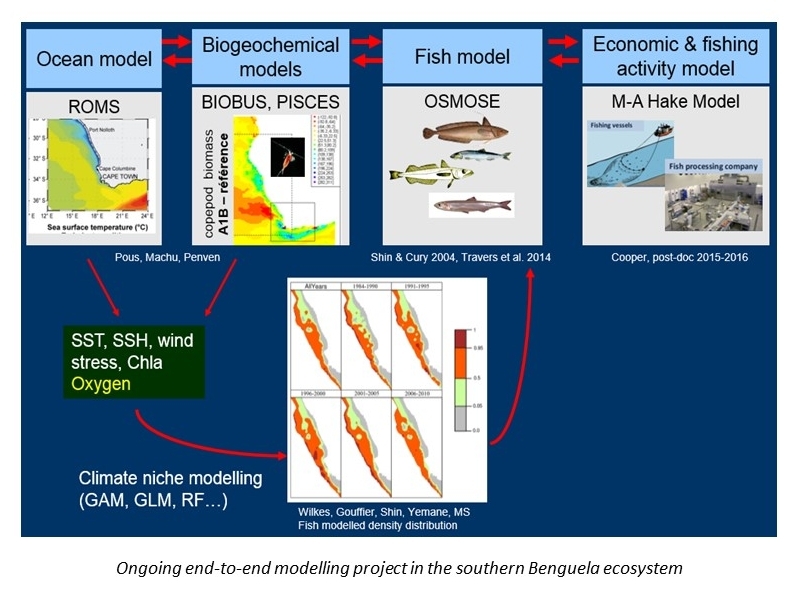 An integrative task within ICEMASA is to develop end-to-end (e2e) modelling approaches in order propose future trajectories of marine biodiversity and associated ecosystem services under a combination of climate change and fisheries management scenarios. The end-to-end models developed in our team (e.g., Nemo-Pisces-Apecosm and Roms-Npzd-Osmose) ensure integration of the main components of the marine ecosystem from the physics, biogeochemistry, exploited fish species up to the fisheries and associated management and socio-economic contexts, while taking into account feedbacks within the environment-human system. To do so, the modelling activities rely on a tight multidisciplinary collaboration, ensuring the challenging coupling between pre-existing disciplinary models . 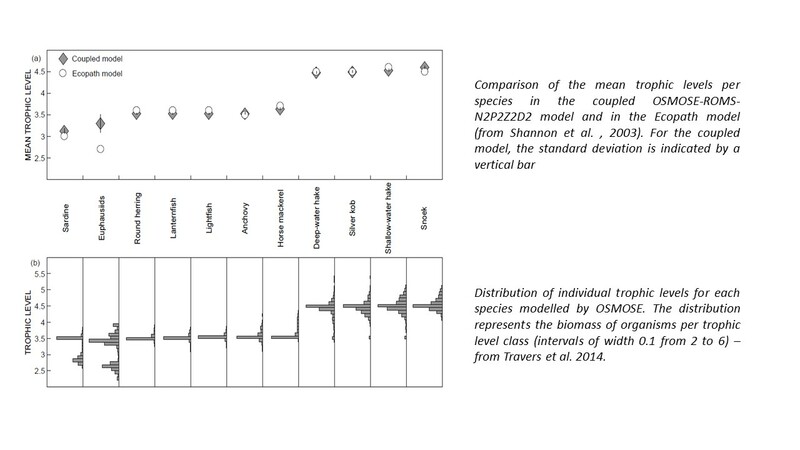 In the southern Benguela, Travers et al (2014) detail how the coupled ROMS-N2P2Z2D2-OSMOSE is parameterized, and compare model output to observations and to outputs from an existing EwE ecosystem model in that region (Shannon et al. 2003). While the predation assumption is very simple in Osmose and only relies on size-based contraints and spatio-temporal co-occurrence of predators and prey, the simulations represent fairly well the fish diets patterns as compared to observations. 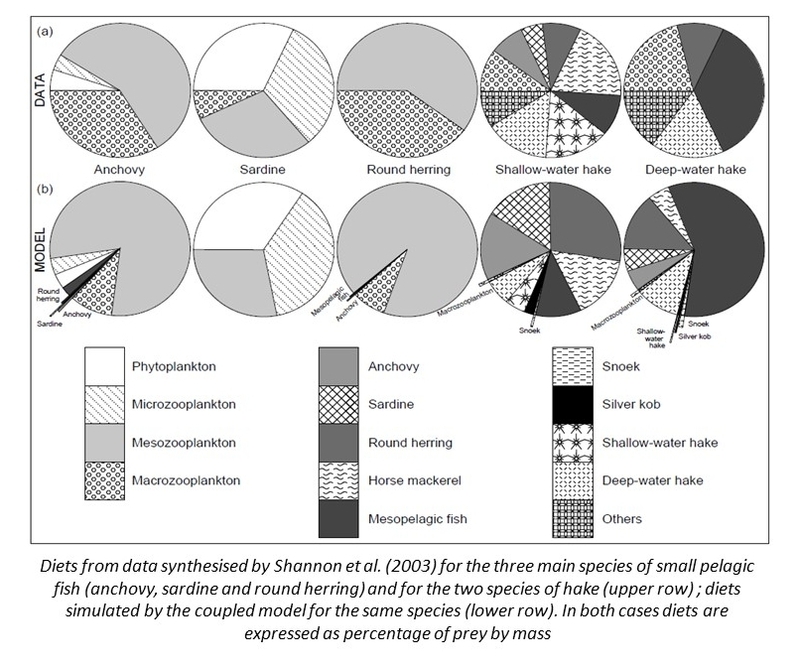 Mean trophic level of fish species are also very close to that estimated by EwE model, the latter model relying heavily on species diet data, as shown below. Further comparisons between ecosystem models in the region have been performed, with a new application of the Atlantis model (Smith et al. 2015). Using the Osmose e2e model, the tested scenarios of combined effects of wind stress and fishing pressure on top-predators show that the bottom-up effect of the climate propagates up the food chain whereas the top-down effect of fishing cascades down to zooplankton but dampens before it reaches phytoplankton. When considered together, both drivers have a synergistic positive effect at the level of top-predators. On the contrary, at the level of forage fish, the combined effects are either amplified when negative, or are dampened when positive (Travers et al, 2014). This study emphasizes the role of forage fish as a key group in the functioning of the ecosystem, which appears to be more vulnerable to changes than previously considered. Also, top predators are good indicators of change, as this functional group displays the highest change in biomass in the different climate and fishing scenarios. Collaborations: Y. Shin (IRD), L. Shannon (UCT), P. Verley (IRD), R. Oliveros-Ramos (PhD), D. Yemane (DAFF), C. Moloney (UCT), J. Field (UCT).